Fido is sitting at your feet wagging his tail ready to take YOU for a walk… No make that a run! Are you ready? Let TUG-NO-MORE make that time with Fido enjoyable. Thank you for your support! We are excited for you to experience the comfort, convenience, versatility and safety of this well-designed system. Whether used for running, walking, hiking skijoring or canicross, with one or more dog(s), the benefits are significant. When you take the harness system out of the box you will notice that all the system components are properly connected. The 'Sport' Harness is constructed with breathable, light weight black mesh. Terrific fit and function! The 'Original' Harness is constructed with a thin foam pad encased in blue nylon. This provides a cushioned fit. Positioning of the harness is critical for proper use. Note, in the picture, that the harness is worn around the hips and buttock. The top of the harness should not be higher than your waistline. The reflective tape, on the back of the harness, should be positioned at the top. When connecting the male and female buckles, the placement of the connected buckles should be placed in front of your hips. Avoid positioning buckles directly on your hips because that could cause uncomfortable rubbing. Once properly adjusted, excess strap material can be controlled with the "excess strap loops" and the velcro across the back of the harness. Harness Straps Form An "X"
Both upper and lower strap components must both be laced through the harness "O" ring when in use. The harness "O" ring needs clear movement from side to side on the straps to accommodate a dogs directional changes. For proper fitting of the harness, make sure the straps form an "X". The upper left male connector must go into the lower right female buckle and the lower left male connector must go into the upper right female buckle. By releasing the two buckles, quick removal of the harness can be achieved. For proper visibility of the reflective tape keep shirts and jackets underneath the harness. Quick Release If presented with a situation that requires immediate detachment of the leash lead from the harness, the quick release should be used. Simply pull the quick release main shaft toward you. This opens the hook releasing the leash lead from the harness. To re-connect, pull the quick release shaft toward you and reset the hook back into position. The shaft will automatically spring back into place holding the hook secure. On our 'Sport' Harness, we have added a ring to the back of the harness to conveniently clip the leash lead if your dog(s) prefer to walk/run behind you. The swivel snap, closest to the leash handle, is anchored to the quick release hook. On the opposite end, you will find the leash lead swivel "O" ring for anchoring multiple leash extensions. The leash handle is there for convenience to rein in your dog(s) at a moments notice. There is a metal "leash lock" which can adjust the leash lead in length. The poop pouch is anchored on the leash lead with a swivel snap to the leash lead swivel "O" ring. To remove the poop pouch from the leash lead (to clean or replace) or to adjust the leash lock simply unclip the pouch snap from the swivel "O" ring. The swivel ring helps to reduce the likelihood of tangling leash extensions. It is recommended to put only (2) leash extensions on one swivel ring if potential tangling is a concern. If you have more than two dogs, an additional leash lead can be used with additional leash extensions. If tangling is of no concern, multiple leash extensions can be connected to one swivel "O" ring on one leash lead. The pouch provides waste management convenience. Plastic liners should be used to carry your dog's "goodies" and placed inside the poop pouch. Thirty liners and plastic scoops are provided with the system. Remove liner from the poop pouch, with waste, after each use and properly dispose. The best method for carrying the waste in the poop pouch is to place the waste in the plastic liner, roll the liner so it is narrow in height resulting in removal of the air from the bag then seal shut. The liner will then fit securely in the pouch. The leash extensions provide convenience for anchoring one or more dog(s) to the leash lead. The swivel snap on one end of the extension is connected to the leash lead swivel "O" ring and the swivel snap on the other end of the extension is connected to the collar of your dog. One leash extension is needed per dog. If wanting your dog close to you, simply attach the leash extension directly to the harness “O”-Ring. 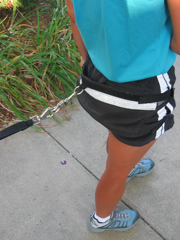 The poop pouch could be anchored directly to the leash extension. The convenient leash handle is built on each extension to reign in your dog at a moments notice. Clean with damp cloth as necessary and line dry. Do not machine wash. Do not use detergent or bleach. If metal pieces get wet, wipe down to remove water. Lubricate metal pieces, when appropriate, to properly open, close and swivel.